The latest Budgie Desktop 10.4 released at 18 August 2017 and this is a short review. The 10.4 brings huge changes on Budgie featuring new Desktop Settings, new Raven, more flexible panel for any position, ability to add new panel and change control buttons position, default bottom-left menu at bottom panel, and so on! 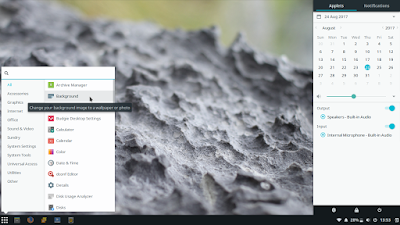 This review is based on Solus OS 3 and not Ubuntu Budgie (because at this day no PPA available for 10.4 yet). This is a quick look to default Budgie Desktop on Solus OS 3. You see this look is already greatly different compared to 10.3 and previous versions. The 10.4 has an overhaul when the layout changed so the panel is now at bottom with left-corner menu (Windows-like, KDE-like). However, Raven position is still the same there as the right sidebar. 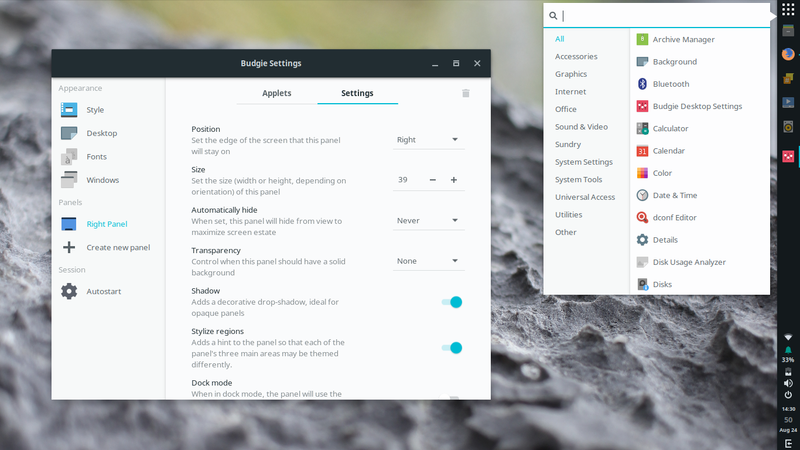 Now, starting at Budgie Desktop 10.4 you can switch the position of panel to lay on left edge vertically, just like Unity Desktop. 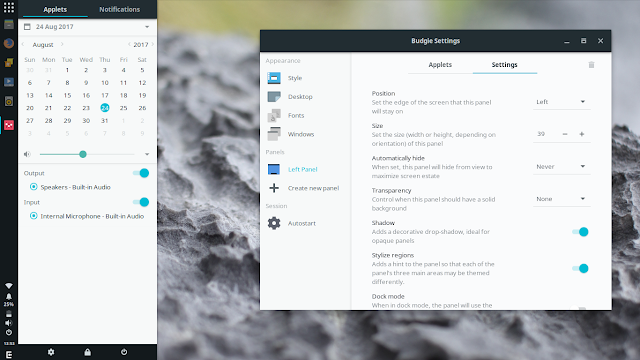 You change it using the brand new Budgie Desktop Settings, on the Panels > Bottom Panel > Settings > Position = Left. You can also move the panel to lay on right edge vertically. So, now, Budgie Panel can be placed on all edges possible (top-bottom-right-left)! This is example of the flexible customization 10.4 gives to you. It's so easy to switch them left to right and vice versa, by using brand new Budgie Desktop Settings. Go to Appearance > Windows > change Button Layout to Left or Right > the buttons switch position instantly! See GIF animation below. Raven the right sidebar is now simpler & cleaner because the settings are moved to Desktop Settings. 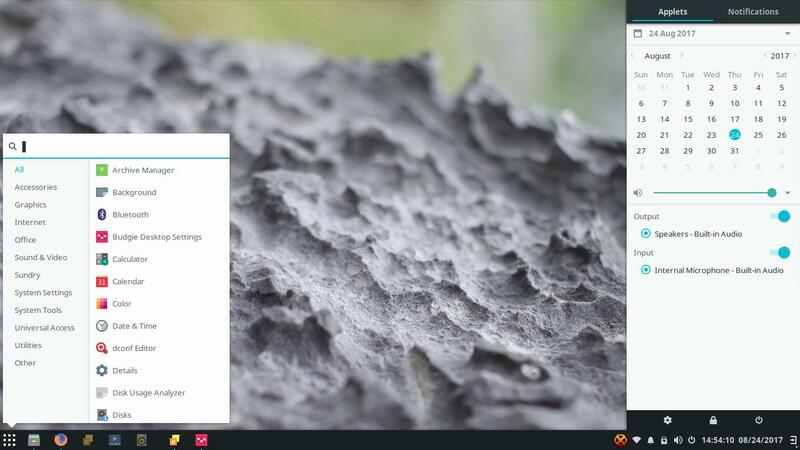 This is a major new feature: Budgie now has its own Desktop Settings program. It features all settings (Applets + Panel) Raven had before, plus ability to create new panels & switch their positions, and also to change desktop theme & icons. Of course, as Ubuntu users I wish Budgie Desktop 10.4 to enter Ubuntu official repository and available to Ubuntu Budgie 17.10. This 10.4 is a huge art worthy for Ubuntu Budgie. However, the fact is, at 24 August there is only at best Budgie 10.3 on official repo for Xenial, Zesty, and even Artful. Even more, the budgie-remix PPA is still at 10.3 as well for now. I'm waiting for the 10.4 to arrive at any Ubuntu release.